Monday 16th July. An overcast humid day, water temp 64 and about 2” on the gauge or thereabouts. John Okell and Graham Nicol here for two days, the last time they were here they were frozen off then flooded off thanks to the beast from the east, it seems a long time ago but it just because it’s been so hot and sunny. Graham saw 3 fish in Learmouth this morning whilst John didn’t see a thing. Its raining tonight as I write this but it’s hardly enough to wet the dust under the trees at the moment. Tuesday 17th July. No change in water levels this morning as expected. 64 degrees and an overcast morning. Graham had a pull in the Learmouth stream and said he’d seen around 6-8 fish. That as far as I know was all the action for the day. The beats below us posted 9 fish for the day so one or two must be nosing in. No proper rain on the forecast yet. Onions looking good in their new bed, great crop of raspberries. Wednesday 17th July. Much the same as yesterday, overcast and humid but the water temp was down to 62 degrees. Tony Darby here for two days with his pals, they fished their way round the beat and I’ve yet to hear any reports of any fish from them. Got some oars upcycled and strimmed all the landing areas at Learmouth ready for the big run when it comes. The bottom beats had a few fish today. Thursday 18th July. Another humid day with just a slight breeze from the west to keep the flies away. Tony Darby and the lads gave it a go and Nick had a wee boil at his fly in the Slap, We tried a sunray in the Cauldstream but to be honest there’s not much Cauldstream to try it in. 63 degrees this morning and I’ve taken a measuring tape to the gauge as it stops at a foot and its now 13” below the gauge so -1”. It’s to rain tonight and half of tomorrow but I doubt if any will reach the river. 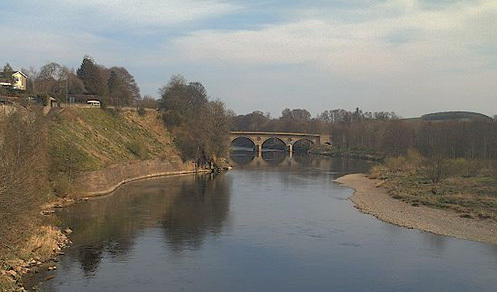 I’m hearing reports of fish down at Norham from some people and others are saying its rubbish, the catches seem to suggest that there are one or two down there, certainly more than is up here. Friday 19th July. It rained today and it rained from first thing until around 6.00pm and the river didn’t move an inch. Nigel Houldsworth here for two days and he brought Bill Warburg with him and its a good job he did as he caught our first fish for July. We were sitting in the cauld dodging all the weed that was coming down as someone above is cutting, we were discussing the pros and cons of Venezuelan ladies (as you do ) when a 7lb fish grabbed his #10 cascade, it wasn’t fresh or big but its a fish. Nigel had fished the entire bottom end with a skimmer hoping he might lift something but he didn’t see a fish all morning. I haven’t received a text to say they have caught anymore so the score for the day is one.